You can easily import contact lists into a Relevant Tools database. When you collect the contact data in a spreadsheet, the spreadsheet should be setup with columns such as first name, last name, company, email and so on. Each row of the spreadsheet should contain all of the information for one contact. The next step is to save the spreadsheet as either a tab-delimited text (.txt) file or a comma separated values (.csv) file on your local computer. 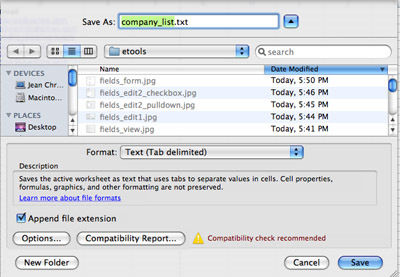 Once the spreadsheet has been created and saved in the one of the formats mentioned above, log into your Relevant Tools account and click on the "DATABASES" button, at the top of the screen. Next, select the database you would like to import the data into in the Database Selection section, shown below, and click on the "SELECT DATABASE" button. Click on the "import" link, at the top of the screen, shown below. At this point, you have the option of naming the group of records you&apos;re importing. If you choose to give the group of records a name, simply enter the name into the text box labeled: Give this group of imported records a name. In our example, we have chooen name our records Initial Import, as shown below. Giving your group of records a name has its advantages. For example, a group name will help you identify the records in case you want to delete them before importing them again or take another action. When the records are imported the Source system field will be updated to contain the group name. Note: Please see the tutorial on Custom Views for your Relevant Tools Database for a short discussion on system fields. Next, locate the import file, prepared above, by clicking on the "Choose File" button, shown below. After clicking on the Choose File button a dialog box will appear allowing you to navigate to the folder where your import file is located on your computer. So, be sure to save your import file in a place where it&apos;s easy to find. Select your file and move on to the next step. Select the file type of the import file you prepared, either the Tab-delimited text file or the CSV (comma-separated) file, by clicking on the appropriate radio button. Next, for each column in your spreadsheet match the name of the column to the name in the pull-down menu for that column, shown below. For example, if the first column in your spreadsheet is First Name then select First Name in the pull-down menu for column 1. Note: The column names in the pull-down menus to the right, in the image below, refer to your import file⁄spreadsheet column names. The Relevant Tools database engine takes care of loading all of the data into the approriate database fields. Finally, click the "IMPORT LIST" button, at the bottom of the screen. You will see the confirmation page letting you how many records were imported, as shown in the image below. Finally, click on the link in the confirmation screen, above, to see your imported contact list, shown below. When you display your database you may see a record containing the header information from your spreadsheet, shown below. This is often a useful way to check to make sure you selected the right fields for each column; this record can be deleted. To delete this record, simply click on the little "d" in the far left–hand column. Now your database is ready for action. You can click on the column headers to sort the data by that column.